The Girdle you HATE to see! In early spring, gardeners are looking to get outdoors and get something done. Why not check your trees and shrubs for girdling roots before the grass starts to grow or the mulch is applied. So what is a girding root? They are roots that cross over the flare at the base of a tree or shrub. They come in all shapes and sizes. Some are small. Some are big and numerous. However, all can do harm to the tree. The remedy is to find them when they are small and cut or saw them away from the trunk of the tree. 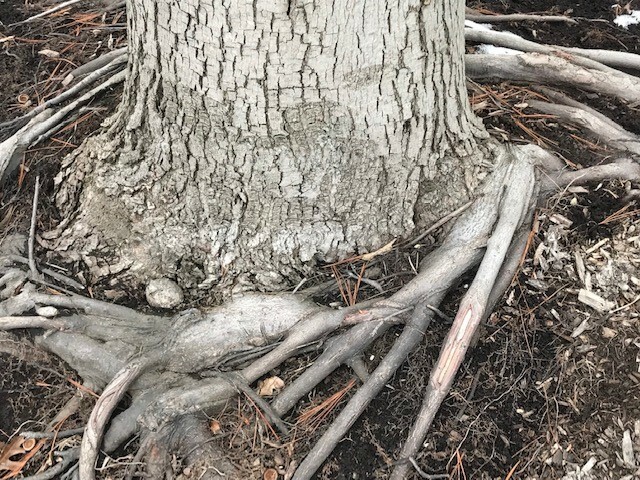 What can cause girdling roots? Sometimes, in the course of nursery production, growers will miss removing the girdling root. A healthy tree should have a good basal flare without any crossing roots. Sometimes girgling roots can be caused when trees are volcano mulched. The take away is “If you see an unsightly girdle, get rid of it!” It might save your tree.